The bathroom is that one place in your house where you can lock yourself up and enjoy the privacy. Lightning in bathroom needs to be perfect in the same manner as that of your master bed room. Here is the list of some easy to do bathroom lightning ideas. Proper lightning at the mirror and near to basin is mandatory. You can select the pair of lights and put them on both side of the mirror. Make sure that the location of light should be a bit high from your eyes and the one that provides a shadow less illumination. Thus, it would be the best place at the time of makeup, shaving, and tooth care and so on. Also, do not place the light just above the mirror. That will splash a strong light above your head and you will experience a shadow below your eyes, nose and chin. Hence, make it useless at the time of makeup or shaving or even at the time of tooth care. You should look best when you see yourself in mirror so, place the lights at both sides of mirror. Use fixtures that will provide a holder to place bulb or LED into it. You can also use fluorescent or LED into that. It is the perfect addition in your master or guest bathroom. It saves your electricity bill and provides lightning in all corners of the room. Make sure not to select the bulbs which are dimmer. Thus dimmer lights will allow your eyes to get adjust early in the morning and it may create the problem to find any item in night as well. Accent lightning is the best to show off if you are very creative in nature. Designed and creative lightning will provided illumination at each piece of art. There are many unique and fabulous styles are available in the market. For instance, bubble shaped lightning, single pendant lightning, square shapes lights, etc. Thus it will give a perfect touch to your bathroom. Also, you can place this accent lightning above the bath tub or at the centre of the bathroom. 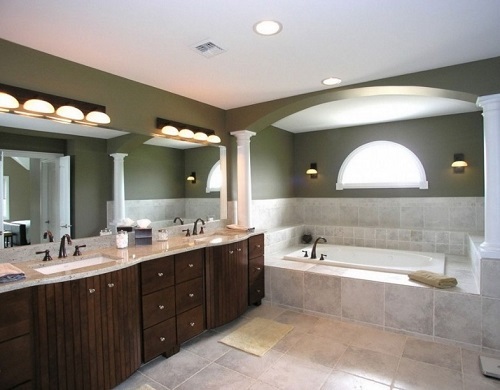 Ambient lighting fixtures are perfect for the master bathroom. Fixtures can easily be installed along the perimeter of the area. Thus, lightning can be enjoyed if the architect can design in that way where architect can hide the fixtures and enjoy the indirect lighting. Addition of candles along with lightning will create sparkling effect in bathroom and create a romantic tone. Make sure to place the candles away from any flammable objects like towels or any cloth item or anything. 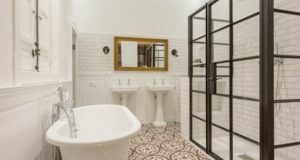 If the walls of the bathroom are dark in colour or it is built up in the middle of the house where there is no source of light then only one option left, put them all together. Put enough light source or fixture to fix up lights as there was not any natural light. Make sure that lights will create proper illumination either it is below the shower, or tub or sink area. 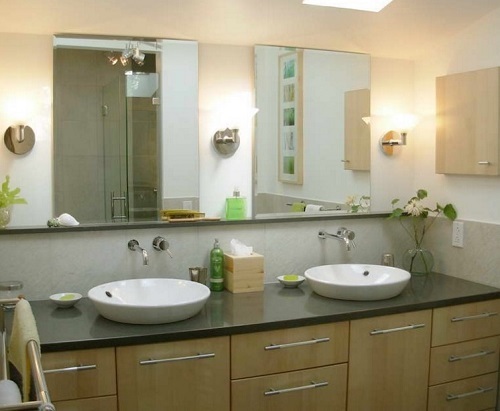 Fix up large mirror at sink vanity and place the light at both sides. 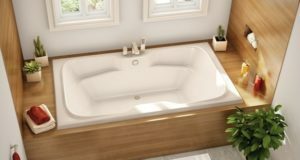 You can use dim lights in the tub area and proper lights in the other corner. Make sure not to make only one switch for light and fan. Put the switches of each combination of light separately so that, you on only that switch which is required.